Restaurant furniture supplier and southern cuisine restaurant collaborate for a strong grand opening with new restaurant furniture. Restaurant furniture manufacturer and distributor, Affordable Seating, has helped Smokin' Brays Restaurant to the triumphant opening of their new restaurant. Smokin' Brays opened their doors on September 14, 2013. The BBQ restaurant is in Dale City, Virgina, 15 miles south of Washington, D.C. The restaurant also offers southern cuisine and comfort food. Owners Keith and Betty Bray have been cooking for family and friends for over 30 years. They serve down home southern favorites such as baby back ribs, pulled pork sandwiches, brisket, chicken, chili dogs, corn on the cob, coleslaw, pinto beans, cornbread, and collard greens. Their meat is grilled on an open flame complete with all the traditional country sides and fixings. Keith and Betty are proud to offer the residents of Dale City authentic down home southern cooking. The food is all locally sourced and made with fresh ingredients. Smokin' Brays serves lunch and dinner Monday and Tuesdays from 11 – 7 and Fridays and Saturdays from 11 – 8. On Sunday it is open from noon until 7. They also offer takeout service. Keith purchased all of his dining room furniture from Affordable Seating because of its reputation for durable attractive furniture at low prices. "We love the quality for the price!" said Dale. Affordable Seating has established itself as a leader in the restaurant furniture business because of its many years of working closely with restaurants and its commitment to high quality. Many of its products are proudly made in the U.S.A.
For seating ordered Affordable Seating's Clarice Ladder Back Metal Chairs which currently sell for only $31 and matching bar stools which sell for $46.99 The Clarice commercial metal chair comes with a standard black sandblast frame finish, plastic glides and a padded seat. The frame is available in 5 different finishes. Customers have the choice of a solid wood seat of a padded seat made of fabric or vinyl. The wood seat is available in 6 different finishes and for an upholstered seat there are many options to choose from. Keith also chose Affordable Seating's Quick Ship Booths for seating. The Quick Ship Booths, which can delivered in just 7 – 14 days are available in black or wine and in heights of 36 or 42 inches. He bought sing and double booths. Restaurant booths are a popular item for many restaurants since they enhance the overall appearance of the establishment and give their patrons more privacy. 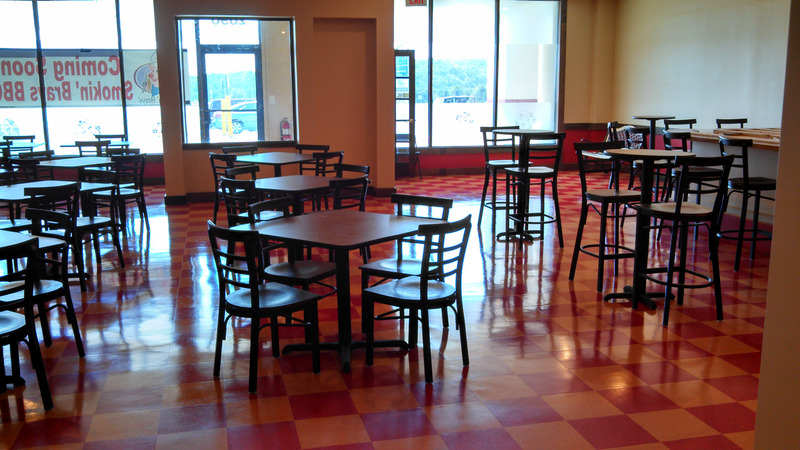 Affordable Seating specializes in restaurant booths offering a wide selection and custom made booths. For tables Keith purchased reversible table tops in oak and walnut finish. Reversible table tops are a popular item for many restaurants and are a great value starting at only $22. They are also available in mahogany and black, with a black t-molding edge. They are available in round, square or rectangular shapes in many different sizes. Smokin' Brays is located at: 2896 Dale Blvd, Dale City, VA. Check out their website at http://www.smokinbrays.com or call (571) 285-2025 for more details.